Jessica's Journal: It's Been a While.. I tried not to look at the date of my last post, since my goal was to keep this blog updated fairly recently. I go back and forth between the understanding that most people really don't care about what I had for lunch or what I did at work or any other mundane details of my life. On the other hand, I wanted to keep this blog as a way to journal all of the events (exciting or otherwise) of my life, just to have something to look back on. So with that warning, here are all the fun details of my week! I've actually had the past ten days off, because February 1st marked the beginning of my FABULOUS new schedule where I work 6 days of (24 hour) call at the hospital a month. That's right, I work full time and I only do 6 days a month. I told you it was fabulous. Anyways, I tried to cram a lot in this past week and a half and I think I managed to succeed. I had the pleasure of taking two of my favorite little girls to pain pottery on Tuesday at a fun place called "You Do the Dishes". You go in and pick a piece of pottery and sit down and paint it in whatever fun way you decide. Since I'm lacking the creative gene, this has never resulted in something I would consider displaying around my house, but I figured the girls would enjoy it and they did. Here are a few pics of them painting their masterpieces (I'm sure their mom can't wait to proudly display the multi-colored miniature horse and whimsical fairy that were painted....I suggested the fireplace mantle!). Inspired by my recent creativity in painting pottery (notice I didn't post any pictures of my "artwork", although the girls promised me it was beautiful. Is it bad that I need to get affirmation from a 4 and 6 year old? 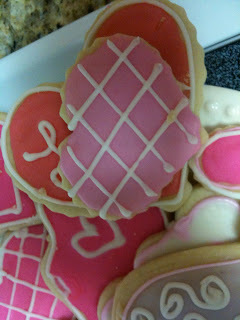 ), I had Tara and Jenn over to bake and decorate Valentines Day cookies. Jenn and I were not new to this process, but Tara was, and we decided to pass on our wisdom to her (read: we needed to have another person to tell us how fabulous our cookies were and to help keep my husband from eating all the dough). Pictures were taken, however, it was 10:30 at night, we were covered in flour and hyped up on icing, and needless to say, the outcome was not flattering. So instead I'll show you the end result. I did learn that you can't stack the cookies before they are completely dried, or they'll stick to each other and end up not so pretty (see picture above). We are by no means experts at this, but we've come along way from our first attempt which included the mistake of tripling the recipe, 9 cups of flour and a handheld mixer....not a good combination. Needless to say, we are getting better and it was a lot of fun just getting to spend time with my sweet friends. Anyways, this is Valentines Day weekend and we've got plans to go to dinner and see Wicked! I am so excited (even though I've already seen it) and have desert with some friends after. I can't wait! Anybody else doing anything special?